It's been a while since I attempted an underwater render so I felt the time was ripe to dive back in. This time I wanted to use Plant Factory to create my undersea flora and fauna. I wasn't trying to model any real life organisms here, but rather create something fanciful and colorful. I'm not 100% happy with how everything turned out (after MANY days of rendering at 8K on Bucephalus) but I do think it looks nice enough to share while I consider revisions. Let me know what you think! See "Symbiota" posted on 4/15/18 as Ryan had to rework this one. "Will there ever be a multi-screen?" Will there ever be a multi-screen of this wallpaper? Being a scuba diver I truly enjoyed this one Ryan. Quite reminiscent of being underwater and just floating around with the "fish". Thanks for this one. Multi Screen please... Pretty Please?? I enjoy the render very much. I believe the only thing I would change is the color of the brown flowery things. I guess I just like ridiculous bright colors. Even though most of the ocean is nothing like that. Just so the title of this review'll make some semblance of sense, I'll put my two cents in for a dual-screener. By the bye, why do we call it "underwater" when it's "inwater"? "Underwater" is actually sand, isn't it? Almost there...plants in the foreground just don't work, anything further away does just fine and I don't see anything else that doesn't work. Still a fine scene all around though. Hi Ryan; given up multi-screens for this one? Hope not, as I would love to see even more undersea/coral reef scenes. ... is where this one belongs. Pleasssssse. First member download, up on My 24 inch now - WOW! I would think that it doesn't have enough contrast. I would think that underwater the furthest distance would be deeper blues, blacks or purples. I don't mind the fish, actually. Someone suggested that the fish should move, that would be interesting to see, but I don't know if that would be compatible with what I have (I tried to download some of those wallpapers several years ago, and couldn't get them to work). I love your work and have been a member for the last 8-10 years. This looks so wonderful on my phone! Reminds me of snorkeling off the Hawaiian Islands. Beautiful colors and plant life, and sea creatures. I love the way this fades into blueness, it is such a real look of underwater. The colours are lovely and the fish look very real too. I like that they are not too obvious so it's great when you spot one! I have always enjoyed the underwater renders. Glad to see another one back in the mix. Personally I would love see something with your Jelly from a long time back. As an avid diver I really appreciate the work that goes in these. This work introduces me and hopefully others to an unseen world one can only imagine. 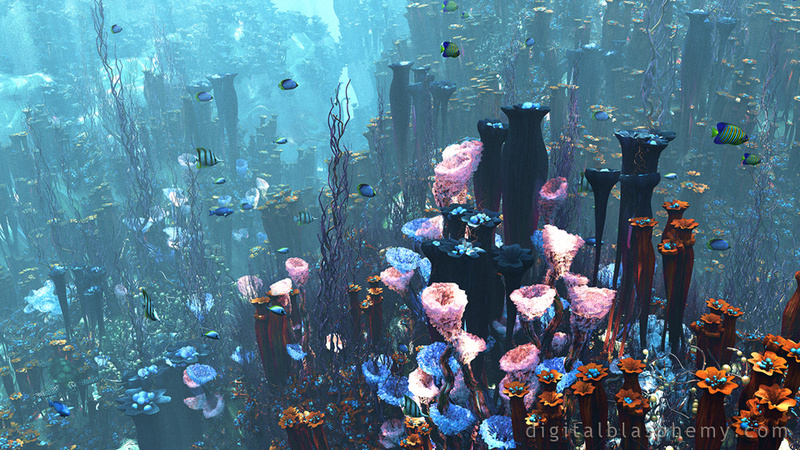 I LOVE the aquatic renders... wold like to see some more vibrant blues, greens, etc... but freakin' awesome! It's a greatmstart, but I feel like the plants are almost more like a watercolor and the distance gets too washed out, while the rest is sharp and clear, so it feels a bit like two different styles in one image. The fish look good, but they're too rigid. Bodies bent in motion and fins waving in different positions would make a big difference instead of looking like they were pasted into the scene. Hope my impression helps. I love to see the underwater renders and this one is no exception. ""If only they could move!"" Wow! This one's really nice, Ryan. The blurs notwithstanding, I really liked the colors of the coral, and every fish was spot-on. It's almost as relaxing to look at as a real aquarium. Very, very nice work, sir. Again, Kudos. You're the best. I absolutely loved your previous underwater scene, but I agree that this one needs some revision. I would actually like this more without the fish. They fill out the scene, but look wrong, at least the wrong perspective (like looking at them from the side, but the rest is from the top). 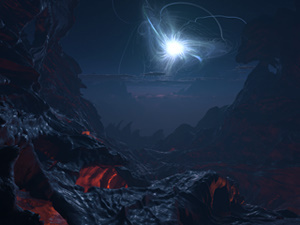 I think it would be great to see some other type of sea creature, something alien. "One of the top DB images ever"
I love the detail and the joy of being taken down to the depths to enjoy all the color and life below. Thank you for creating such an amazing scene, Ryan! Having been an avid diver for over 25 years I have seen "a few" breathtaking underwater scenes. The right half of the image is spot on for a vibrant ecosystem, at around 30 feet of depth, when a strong sun ray comes through. Laminaria can have that beautiful rust/burnt orange color as you are displaying. On top of that, your light rays don't hit every object (as they shouldn't). I get that some feel the color or shape of something, reminds them of things you wouldn't expect to see, in the ocean. The fact that there are SO MANY things you would never expect, in our real ocean, combined with the fact that your were creating "something fanciful", means you have done an excellent job, taking from your mind's eye and creating a beautiful piece. When you dig in, you see that you have put a lot of details big and small into this. The kracken in the back is a nice touch! I adore undersea pieces and this one is shaping up nicely! The pink is getting to me, though. It's not a color I see when I'm snorkeling and it's distracting me from the rest, which is simply marvelous. The pink and blue funnels send my brain straight to the county fair. They are very similar tints of pink and blue, and fuzzy and abstract enough that cotton candy is the only thing that I can see them as. That's really my biggest issue with the render, are those cones. I like the overall composition, light/dark balance, and the forms of creatures. The orange flower-like corals could probably use to be more striking, or more bland. I like the shapes, though; they are cool in that they look like underwater blossoms. I can see how the zoom here results in a less striking piece, though. A more detailed view of a smaller area might be a lot more engaging. The lighting and colours are simply beautiful sort of reminds me when, I was in Diego Garcia. Awesome render my friend. Really lovely! And I like all the fish! I really do like this image, but it's really grainy, and that seems to take away from the image. I think this is a nice render but some of the flowers in the forefront look totally artificial, and I think there are to many pink flowers as well. And the depth is off a bit as well. For some reason this makes me feel like I'm diving in blood-temperature water. Where does the sensation of warmth come from? Wish it were a little less cloudy but still its nice. I did notice the kraken hiding in the back. Yeah, pun -- but there's no way to word around the fact that the clarity fades in only about three steps rather than gradually. Otherwise? I like it, quite a bit. In fact I can't think of an aquascape any better.